Jaipur city, Rajasthan India is part of the Tentative list of India in order to qualify for inclusion in the World Heritage List. Most "cities" in India don't really have historic structures or buildings, but are a sprawl of concrete buildings. And dirt and trash for that matter. Trust me: If you haven't been, you cannot imagine. Jaipur is different in the sense that it really has a consistent historic core. You can take a walk through the town center and do site seeing. The city center is called Pink City due to the color of the houses. 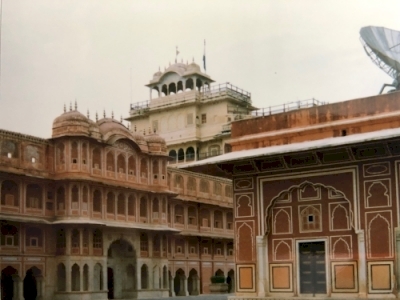 Pink is the color of hospitality in Jaipur and the city was painted in it in preparation for a visit by the Prince of Wales in 1876. Jaipur itself is not that old. It was founded the 18th century when the Maharadscha moved his capital there. This explains a bit the consistency of the city center which was developed by an Indian architect, Vidyadhar Bhattacharya. Apart from the Jantar Mantar, the Palace of the Wind (Hawa Mahal) is probably the most known building of Jaipur. While it does look pretty on photos it did not impress me much on entry. The state of preservation wasn't good. As was the case for most of the old town. 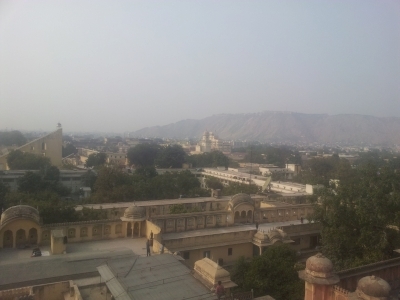 Looking at Jaipur as a consistent example of 18th century Indian town planning and architecture, that is still fairly consistent, there is little doubt in my mind, this should be inscribed. With the Jantar Mantar already on the list, however, it begs to question why not go for a simple extension? In addition, the state of preservation was poor in 2013 and some renovations would be in order. I flew in from Bangalore and left by train to Agra. The trains to Agra are fast. If the train schedules work out, you may even try either as a day trip. Delhi can be done by car. Apparently many tourists do this as a combined trip called Golden Triangle. Nearby Amer has on of the Hill Forts of Rajasthan. If you visit Jaipur, visiting Amer is a must. There are several additional (not WHS) forts in the area.